Tony McCoy notched his first winner since coming back from a serious back injury when Albertas Run landed the Royal & SunAlliance Chase for trainer Jonjo O’Neill. The winner is owned by Trevor Hemmings, who was completing a quick double following Old Benny’s victory 35 minutes earlier. Despite the satisfaction of victory, McCoy was self-critical at having led two fences out, and said: “I should have been a bit cooler. He idled when I won on him here in December, and I should have waited a bit longer today, but when a horse is going so well you don’t want to keep disappointing them. O’Neill said: “It’s marvellous to get a winner on the board. The horse jumped great and travelled well so it was always looking good. There was plenty in the tank coming down the hill, and when Tony looked between his legs I thought there must be a little bit up his sleeve, so I was happy on that. Roll Along finished the Royal & SunAlliance Chase with such gusto that he went from fourth to second after the last and had the owners wishing that the race had been just a little longer. But there was a brief moment of anxiety for connections: “Down the back he stumbled and I wasn’’t sure for a minute whether he was sound, but then he settled and I was nudging away,” said jockey Timmy Murphy. Owners Bryan and Philippa Burrough, famous for their connection with Grand National winner Corbiere were very pleased with the performance: “He made a couple of mistakes, but we’’ve always thought that he would make a three-miler and that proved it,”” he said. “He was very well-behaved before the race, which gave his confidence. He does need a lot of gaps between his races.”” added Bryan’’s wife and co-owner Philippa Burrough, though both were left wondering what might have happended had Roll Allong started rolling along a little sooner. A deadpan Carl Llewellyn suggested that he was disappointed: ““I was hoping we would win it and we didn’t,”” he said. Class 1, Grade One, £170,000 Total Prize Fund. 2.35pm Cheltenham, Wednesday, March 12, 2008. For novice 5-y-o+, three miles and half a furlong. Weights: 5-y-o 11st 2lb; 6-y-o+ 11st 4lb. Allowances: mares 7lb. Entries closed January 22, entries revealed January 24 (78 entries), forfeit stage February 19 (46 remain), six-day confirmation stage March 6, final declaration stage 10.00am, March 11. Form figures supplied by Weatherbys and are correct up to and including the racing of Monday, February 18. May not include some overseas form. The Grade One Royal & SunAlliance Chase is the championship contest for staying novice chasers and this year’s race has attracted a healthy 78-strong entry, including 22 from Ireland and two from France. The current market leader for the three-mile contest is the Willie Mullins-trained Glencove Marina, unbeaten in two starts over fences. The six-yearBold was 10 lengths superior to the Tom Taaffe-trained Finger Onthe Pulse in the Grade Two Paddy Fitzpatrick Memorial Novice Chase, over two miles and five furlongs at Leopardstown on January 13. Mullins has won the contest twice with Florida Pearl (1998) and Rule Supreme (2004) and his five-strong entry also includes Arbor Supreme, J’y Vole, Pomme Tiepy and Scotsirish. Joe Lively has been a revelation this term for West Country trainer Colin Tizzard - who also has the smart hat-trick seeking Leading Authority - and notched his fifth victory over fences in the Grade One Nigel Clark Feltham Novices’ Chase at Kempton on Boxing Day from Here’s Johnny, trained by Victor Dartnall, and the Paul Nicholls-trained Silverburn. 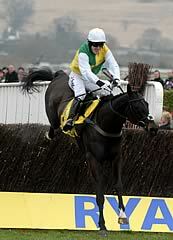 Nicholls landed the last two renewals with Denman (2007) and Star De Mohaison (2006) and his seven-strong entry includes the 2006 Grade One Anglo Irish Bank Supreme Novices’ Hurdle winner Noland, Big Buck’s, Dear Villez, the once-raced and unbeaten Leading Attraction, Ornais and Nevada Royale, who was leading Joe Lively when falling at the last fence in a Grade Two contest at Newbury on December 2. Charles Egerton has entered Hobbs Hill, unbeaten in four starts over fences and eight lengths too good for the Nigel Twiston-Davies-trained Battlecry in the two mile, three furlong Grade Two BGC Noel Novices’ Chase at Ascot in December. Twiston-Davies won the race in 1993 with Young Hustler and his entry this term also includes Imperial Commander, successful twice over fences and fourth to Joe Lively in the Cheltenham Business Club Novices’ Chase in December, as well as Tramantano and Nudge And Nurdle. The Howard Johnson-trained Tidal Bay, runner-up in the 2007 Grade One Ballymore Properties Novices’ Hurdle at The Festival, completed a hat-trick at Cheltenham on December 15, when winning the two mile, five furlong boylesports.com Fon-A-Bet Novices’ Chase from the Philip Hobbs-trained Gold Medallist and Duc De Regniere from the Nicky Henderson yard. Johnson has also engaged No Refuge, winner of the 2005 Ballymore Properties Novices’ Hurdle at The Festival, while Nick Gifford has entered Wee Robbie, successful in the Grade Two Montpelier Group Lightning Novices’ Chase at Ascot on January 19. Alongside Gold Medallist, Hobbs has also entered Lead On, winner of the Grade Two Utopia Group Dipper Novices’ chase at Cheltenham on January 1, as well as Mark The Book and Pancake. The Gary Moore-trained Verasi was no match for Lead On at Exeter on December 7, but subsequently defeated Labelthou in a Grade Two at Lingfield and added an extended three-mile contest at Warwick on January 12, from the Alan King-trained Old Benny. Barbury Castle handler King has also engaged Trigger The Light and Stoway, while David Pipe’s trio of entries are Coral Welsh National third Over The Creek, Paradi and Pauillac. Air Force One, runner-up to Wichita Lineman in the Albert Bartlett Novices’ Hurdle at last year’s Festival, has been entered by trainer Charlie Mann, having secured victory over fences at Folkestone on January 2. The trainer may also run the useful Bagan. Jonjo O’Neill has engaged the prolific Alberta’s Run, who landed the extended three-mile Club 16-24 Novices’ chase at Cheltenham in October, while Nicky Richards could run the smart but inexperienced trio Double Default, The Whisperer and Money Trix, who returned from a 21-month absence to hose up at Newcastle on January 16. The fantastic Irish entry includes the Edward O’Grady-trained Sky’s The Limit, winner of the 2006 Coral Cup at The Festival and successful in both the Grade One Ballymore Properties Drinmore Novices’ Chase at Fairyhouse and the Grade One Durkan New Homes Novice Chase at Leopardstown in December. The Jim Dreaper-trained Notre Pere won the three-mile Grade One Knight Frank Ganly Walters Novice Chase at Leopardstown on December 28 ahead of Callherwhatulike (3rd), Secretofshambhala (6th), Drunken Disorderly (fell) and Dreux (pulled up). Joseph Crowley has entered Hairy Molly, winner of the Grade One Weatherbys Champion Bumper at the 2006 Festival and yet to jump a fence in public. Charlie Swan has Drunken Disorderly, a Grade Three winner at Galway in October who has fallen in good company the last twice. The Noel Meade-trained Cleni Boy was a high-class novice hurdler last term, who scored at the first attempt over fences at Down Royal on December 26. The French raiding party consists of the Arnaud Chaille-Chaille-trained Okaido, who fell behind Lead On at Cheltenham on January 1, and Pommerol, successful over an extended two and a half miles at Auteuil on December 2, for trainer Francois Doumen. 1. The Royal & SunAlliance Chase had a slight name change in 1998, having been run as the Royal SunAlliance Chase for the first time in 1997. But Sun Alliance, which merged with Royal Insurance in 1996, is among Cheltenham’s longest-running sponsors. The Sun Alliance Chase was run for 23 years and Sun Alliance sponsored at Cheltenham for 26 years altogether. From 1971-3, the Foxhunter Chase was titled the "Sun Alliance & London Foxhunters." 5. Fred Winter has the best record in the contest, having landed three victories with Killiney (1973), Pengrail (1975) and Brown Chamberlin (1982). Among current trainers Willie Mullins and Paul Nicholls have both landed the race twice, Mullins having sent out Rule Supreme (2004) and Florida Pearl (1998) while Nicholls has trained the past two winners – Star De Mohaison (2006) and Denman (2007). 10. The West Awake is the only horse to have won both the Ballymore Properties Novices’ Hurdle (previously the Royal & SunAlliance Novices’ Hurdle) and the Royal & SunAlliance Chase. 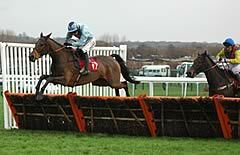 He won the Hurdle in 1987 and the Chase in 1988.